We’re excited to launch the blog section of our website as a platform to share stories, news, tips, tools and maker happenings in the community! "This does not accurately portray how excited I am that my Maker's Magazine is here!! I cannot wait to open this up and see all of the beauty contained in it! I'm so elated to be a part of this and to read about all the amazing makers inside. Thank you so much @makersmovement!" magazine which is filled with inspiration and beautiful photos. I especially love the piece by @larkandarrow! "Life is not meant to be experienced alone. The things we can accomplish with the support and help of others is greater and more meaningful than what we can accomplish as individuals. Life and creativity are not a competition. There is no prize in the end for beating out everyone else. If you feel you must have that trophy, join a sports team! But life and creativity need a different approach." magazine - Mother Nature, an inspiration indeed." "The gorgeous #makersmagazine by @makersmovement is finally here and I am swooning. Super inspired by the other artists in these pages who also use nature as their muse! Thank you Sam for creating a positive community, for encouraging my artwork and for curating my work into this amazing magazine; I am insanely proud to be a representative of your movement and so honoured to be in the pages of the first beautifully published issue. It is a beautiful collection of words and creations by creative women who can't help but connect with Mother Nature through craft." "Well done @makersmovement. #makersmagazine is beautifully curated and I feel lucky to be apart of your first issue." 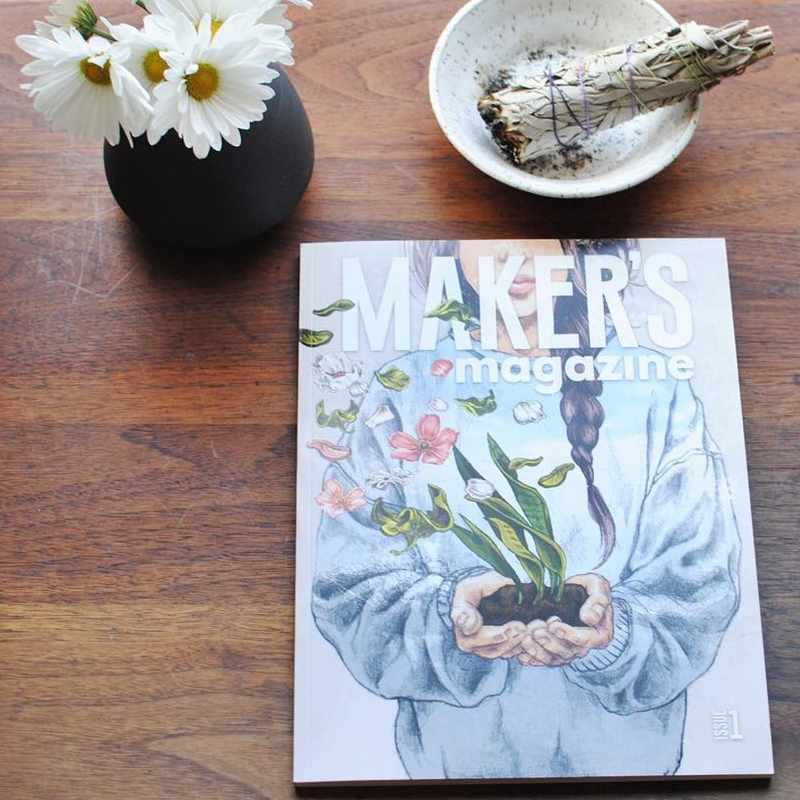 "Mum brought me fresh tulips ~ Ahhh and Issue 1 of @makersmovement came in the mail today." "Oh my folks! My Maker's Movement Magazine is here! I can't believe that my artwork is featured amongst some of the most talented ladies out there. I feel so lucky to be apart of this community and completely inspired after reading everyone's stories. Thank you so much @makersmovement for being so encouraging and supportive of antlers+honey. I'm so excited to be apart of whatever is next for this growing movement! P.S. If you are wanting a little creative inspiration go over to @makersmovement to get your magazine too!" "My Makers Magazine arrived a few days ago! Finally found some time to sit down and read it! Thankful to be virtually surrounded by such an amazing community of makers and blessed by their talents and their hearts. Thank you @makersmovement for creating such a lovely magazine! If you haven't already purchased one, it's well worth it!" "It's HERE!!!! My copies of Issue 1 of #makersmagazine arrived today and I'm floating on air. So honored to be included in such a beautiful publication (the paper is gorgeous!!!) with so many talented makers!!!" "Yesterday my Maker's Magazine arrived! It's so exciting to see the amazing work of so many talented makers and artists printed. Congrats to the Maker's Movement team for creating this gorgeous magazine, it's really stunning! Oh and I highly recommend to order your own copy before they're gone." magazine, and seeing your work in there! So proud and happy to be included in this incredible group. Go get a copy!" "IT'S HERE, IT'S HERE! I'm in this magazine!! See you in 4 hours. I'm about to absorb myself into this magazine!" 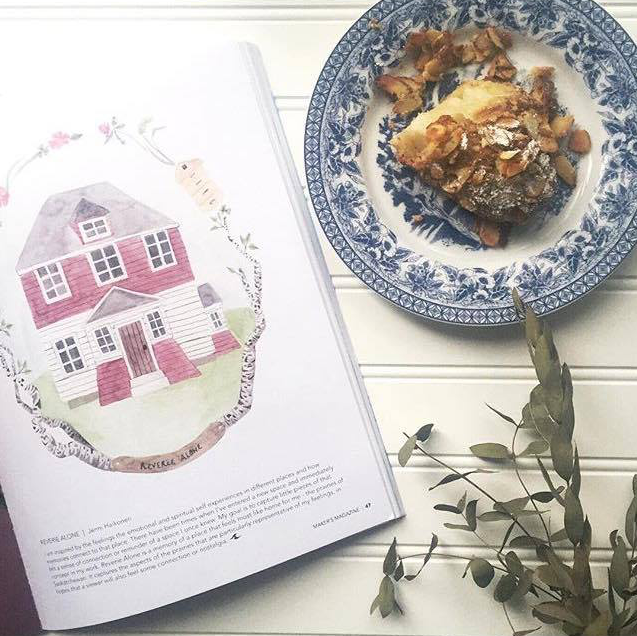 "Almond croissant & @makersmovement magazine on a rainy day. So cool to see my artwork in print! I was also thrilled to see so many other makers' that I've connected with scattered throughout the magazine. This Instagram community of creatives astonishes me constantly." "Good morning beautiful people! Enjoying my copy of Maker's Magazine from @makersmovement. This is a gorgeous publication. I'm both thrilled and completely humbled to be in the company of so many talented artists and writers featured in it." "What a surreal moment for this small emerging artist. The first time to see your work and website in print. Thank you @makersmovement for choosing to work with me and supporting my dream." @makersmovement's first issue of #makersmagazine to read your Makerscope (creativity + horoscope) — an original art/astrology collab between @linienliebe and The Dragonfly Continuum." "We've got a big snow storm rolling in and everyone is getting ready to be home bound for a few days. I'd say I'm all set now that I've got my #makersmovement magazine. I absolutely cannot wait to get lost in these pages." "Received this about a month ago and I still love going through it! So many amazingly talented artists in one magazine!" "OMG it's ME. In PRINT! Lots of yummy reading in Issue 1 of Maker's Magazine by @makersmovement"